It may be unexpected, but the poison center receives many calls every year about accidental ingestion of the pet’s medication. Pets can be on the same medicines that humans take, but there are also medications specifically developed for animals. The answer depends on the type of medication, so let’s go over a few of the most common pet meds. Missouri Poison Center receives many calls every year about accidental ingestion of pet medication. Most pet medication exposures can be safely monitored at home. Keep pet medications out of sight and reach, in a separate location from human medications. It may be unexpected, but the poison center receives many calls every year about accidental ingestion of the pet’s medication. It is often hidden in something tasty like cheese or peanut butter and someone may accidentally grab it for a snack. Other times, a child crawls over to the bowl before the pet has a chance to eat their medicine. Even adults take the pet’s medicine by mistake while they are dosing themselves with their own daily medication routine. However it happens, it is always a good idea to call the Poison Help line to see what to do next. Pets can be on the same medicines that humans take, but there are also medications specifically developed for animals. The answer depends on the type of medication, so let’s go over a few of the most common pet meds. Heartworm medicine contains an anti-parasite medication (such as ivermectin or milbemycin). It is used to treat or prevent parasites in animals, especially heartworm in dogs. Some of them contain ingredients that are also used to treat parasitic infections in humans. In general, an accidental dose of a pet’s heartworm med is not expected to cause serious symptoms in a healthy individual. Side effects may include rash, headache, dizziness, stomach upset, diarrhea, and a mildly rapid heart rate. Flea and tick medication can come in a variety of forms including topical sprays and liquids and oral tablets. There are many possible ingredients, depending on the formulation. For example, sprays often contain insecticides called pyrethroids which can cause an allergic-type reaction if sprayed in the face (sneezing, coughing, runny nose) or an upset stomach if ingested in a small amount. It can also be irritating to the eyes causing redness, stinging, tearing, and pain. For advice on how to rinse the eyes after an eye exposure call the Missouri Poison Center. Liquids that are applied to the skin of the pet can also contain pyrethroids or another type of insecticide, imidacloprid. This ingredient is not expected to cause significant symptoms in the small amount available in the application tube. Tablets may include a variety of pesticides including some already mentioned above, such as imidacloprid. Others may include spinosad, which is a natural substance made by bacteria in the soil. It is used on agricultural crops but is also found in medications for dogs and cats. It is of low toxicity to humans. Pets can also be on the exact same medications as humans. For example, they can get infections that require treatment with an antibiotic. Just like humans, after surgery they may be given pain medications. Sometimes they may need treatment for inflammation with steroids. Pets can have chronic diseases such as diabetes, high blood pressure, arthritis, and depression to name a few. The bottom line is most of these disease states are treated with the same medications that humans are given. As a result, they should be treated just as cautiously as human medications. Keep pet medications out of sight and reach, preferably in a locked cabinet, and in a separate location from human medications. Keep all mediations in their original containers so that ingredients can be identified easily if an exposure occurs. Allow time for the pet’s fur to dry and the substance to be absorbed before allowing children to play with the animal after applying a topical product. Keep children out of the room while giving the pet their medication. Ensure the pet has swallowed the tablet and that it is not left in their bowl. 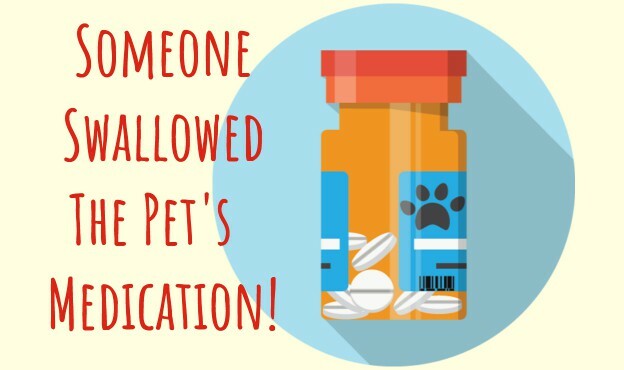 Do not give the pet their medication at the same time you are taking your own medication. If ANY pet medications are ingested, no matter if it is a child or adult, call the Poison Help line at 1-800-222-1222. Specially trained nurses and pharmacists are available 24/7/365 to answer your questions. The service is free and confidential.